Oriental Fruit Moth (OFM): Third flight adults are present in southern counties and starting to emerge in northern counties. The timing for 3rd generation treatments is now statewide. Treatments should be finishing up in southern counties and just starting in northern counties. Brown Marmorated Stink Bug (BMSB): Trap counts and activity are about the same as during the previous week. One orchard in Hunterdon County had a trap count with 6 adults and 13 nymphs. With this kind of population pressure, growers will need to apply full block sprays with BMSB effective materials. If stretching the spray interval, then the outer border rows should be treated every 7 days. Codling Moth (CM): Trap counts have increased over the past week, mostly in southern counties. Treatments for the second generation in southern counties should have been applied last week, and now in northern counties. If trap counts still exceed 5 males per trap then additional treatments are needed. A third generation will need to be treated by early to mid August, depending on where you are in the state, and the population pressure on your farm. Woolly Apple Aphids (WAA): Additional farms were seen in northern counties with small WAA colonies. WAA is now widespread in a number of apple plantings. This insect needs to be treated now if it is present, since waiting will only lead to larger colonies in the face of repeated pyrethroid use, mostly for BMSB. If using a neonicotinoid, make sure to add a spreader/penetrant with the insecticide. Do not plan on good control with Movento at this time of year, since the leaves are too thick and tough for the insecticide to be properly absorbed and translocated. If you can still use Diazinon (max. of 2 foliar applications allowed per year), it will probably give you the best control. Grape Berry Moth (GBM): The timing for 3rd generation GBM treatments should be July 26-28 in southern counties for Intrepid and Altacor use, and about July 30 to August 1 if using pyrethroids or Imidan. Grape Root Borer (GRB): Adults have been emerging for the past several weeks. Populations are very light and very few pupal cases are being found in vineyards from emerging adults. See last week’s newsletter for treatments. However, this does not appear to be a significant pest in monitored vineyards. Grape Insect Trap Counts: 8 Grape blocks in southern counties. Spotted Wing Drosophila (SWD): This is still the insect of concern. Trap counts have increased since last week. In Atlantic County our average trap count was 10.42 with a high of 55. In Burlington County our average trap count was 15.5 per trap with a high of 96. Trap captures have increased each week since the mid June. As the season has progressed, adult flies were first found in just a few sites to now being found on virtually all monitored farms, as seen in the percent of traps with SWD adults. Trap counts are only an indication of relative population pressure, but this does show that as the population increases and becomes more widespread, control becomes more important for the later season harvests. Figure 1. 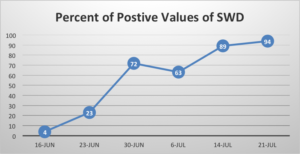 SWD percent positive traps through the season. Blueberry Maggot (BBM): During the past week we had no BBM captures in Burlington County. However we did have an average trap count of 0.1 with a high of 6 BBM in Atlantic County. This is still a pest of concern, but will be controlled by most of the treatments being used for SWD. Oriental Beetle (OB): This week’s traps have decreased. The Atlantic County maximum per trap was 8,000 and the Burlington maximum was 10,175 per trap. As the weeks progress OB numbers will decrease. We are now past the timing where imidacloprid treatments will be effective. Any treatments applied during August or later are a waste of money. Putnam Scale: Crawlers can still be found on sticky tape traps, but at very low numbers. We are now between generations. If you had scale-infested fruit, note the fields which were infested and plan on a treatment in a few weeks. The average trap count in Atlantic County was .71 crawlers per trap with a high of 2, and in Burlington County the average was .3 with a high of 1. Sharpnosed Leafhopper (SNLH): We are also between 1st and 2nd generations for this pest. No treatments are needed until we get close to peak activity during the second generation of adults, usually in late September to early October. Aphids: These are no longer an issue, although Elliott plantings will continue to have higher populations than other varieties. Growers will need to concentrate on SWD for the remainder of the season.